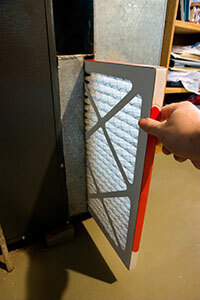 Don’t Forget to Change the Filters on Your Gas Furnace! A heating system is one of the biggest investments you’ll make in your family’s home comfort. But if you’re not changing your furnace’s air filters regularly, you’re probably spending more than you should on heating bills – and you could be reducing the life of your furnace by months or even years. When an air filter clogs, it makes it difficult for the air you paid to heat to flow into your home – which means your gas furnace has to work harder to do its job. Sap your efficiency – Dirty filters can add as much as 20 percent to your monthly heating bills, costing you far more money than the replacement filters themselves. Make you less comfortable – When your filter blocks air flow, less heated air will reach your living space – which means your home won’t be as warm or comfortable. Result in costly repairs or premature breakdowns – Over time, a dirty filter can lead to the kind of overwork that causes parts to wear down and break. The result for you? Costly heating system repairs – or even a premature and irreparable breakdown. The good news is you can avoid many of these problems simply by keeping an eye on your furnace filter. Check it once a month during the height of the heating season – a bit more if you’re a smoker or have furry pets. If you don’t know how to do check your furnace filter, contact us – we’ll walk you through this important maintenance task. Check your filter once a month to avoid unnecessary repairs and premature breakdowns. If your heating system isn’t working as well as you think it should, contact us today – we’ll figure out the problem so you stay warm and cozy this winter. Previous PostPrevious Thank you for choosing Broward Factory Service! Next PostNext How are we Doing?